How do I view my Canvas groups as a student? You can see the current groups where you are enrolled using the Global Navigation Menu. If you do not see any groups listed, you have not joined a group or been enrolled in a group by your instructor. Previous groups are listed under the Previous Groups header. 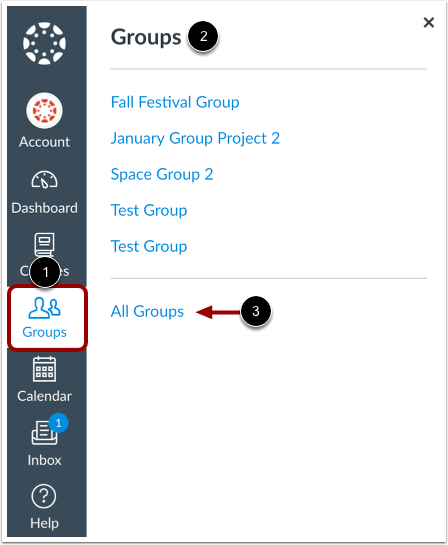 In Global Navigation, click the Groups link , then view your current groups . To view all your groups, click the All Groups link . Groups are organized into Current Groups  and Previous Groups . Current Groups are groups in courses that are part of the current semester or term. You can view the name of the group  and the course name for the group . If a course includes a term date , the term date displays next to the course name. 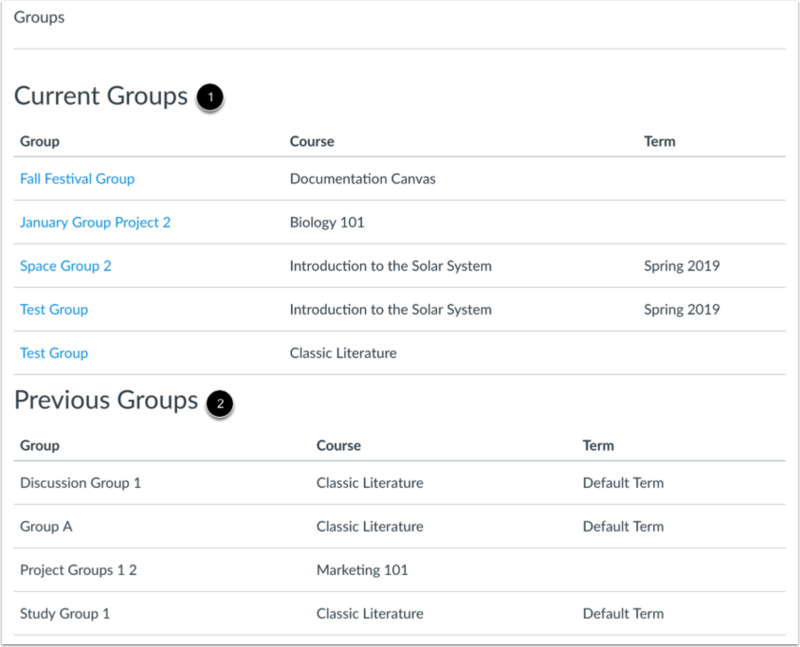 Depending on access settings for a course, Current Groups can also display groups in courses that have been published but have not yet started. Groups that are available to you display linked text . These groups are associated with current courses. To open a group, click the name of the group. Groups listed under the Previous Groups heading are groups that are part of courses that have concluded. Students cannot view group material nor interact with the group after the course is concluded. Note: Some institutions may not allow previous groups to display in the Courses page. Previous Topic:How do I view all groups in a course as a student? Next Topic:How do I join a group as a student? Table of Contents > People and Groups > How do I view my Canvas groups as a student? It might be useful to add that students can access their groups for a particular course from the To Do list from Course Home. Thanks for your suggestion! I've shared it with the rest of my team. We're working on a way to best way to address this in the guide.